Guided bike tour of Barcelona, which allows you to discover the city in a relaxing, leisurely way, as you bike through its squares and streets. Discover the city’s fascinating corners with our experienced local guides who will tell you about its history together with exciting anecdotes. What you will see: Born, Gothic Quarter, Old Harbour & Barceloneta beach, Olimpic Port, Sagrada Familia or Poble Nou, Ciutadella Park and much more. The booking is really simple: enter the number of persons and choose the desired date. Click on "Add to cart". Immediately after booking you will get an e-mail confirming that we received your booking. Within 24 hours you will receive a booking confirmation. In Spain, 0.5 per mil alcohol is also valid for cyclists. It is not allowed to participate in the tour under the influence of alcohol. Participants that appear unable to ride safely are excluded from the tour. A refund will not be made. The tour takes place in normal weather conditions. If the tour does not take place due to extreme weather conditions, such as storms, heavy rain and thunderstorms, you can either choose an alternative date or receive a full refund. A cancellation of the tour from the organizer can occur on the spot and immediately prior to the event. 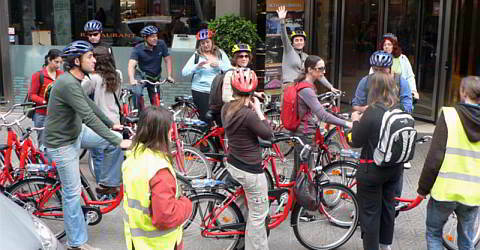 The Barcelona Classic City Bike Tour is suitable less trained people as well as children starting at the age of 12. In small groups you will explore the city driving over easy and safe paths. You will drive traditional city bikes. During the Barcelona Classic City Tour by Bike you will see a lot: for example the gothic district, the old harbour and the Parc de la Ciutadella. With a lot of fresh air you get to explore the city in an active way.